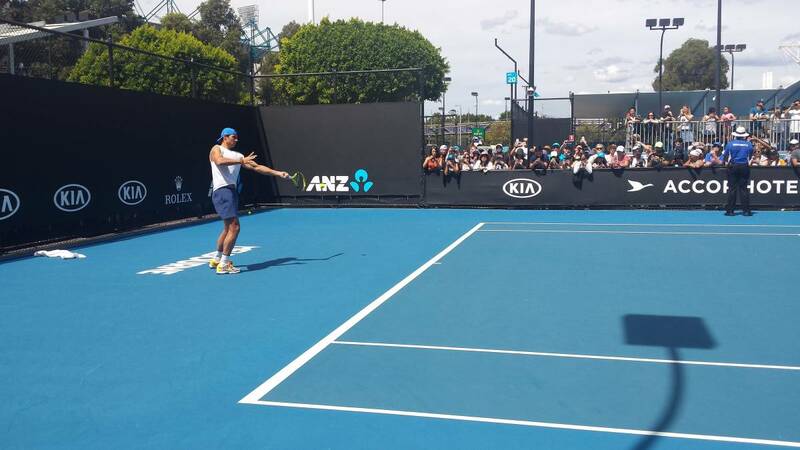 Nadal worked from 3:30 p.m. to 4:00 p.m. on one of the training tracks in Melbourne Park with an audience that encouraged him and which he awarded with autographs. Rafa Nadal has trained this Sunday for the last time before the final of the Australian Open that will take place at the Rod Laver Arena at 19:30 (09:30, Spanish time, Eurosport) . The Spaniard has rallied with his coach , Carlos Moyá, for half an hour, between 15:30 and 16:00 hours in Melbourne. With moments of intensity, very good signals and the supervision of Dr. Ángel Ruiz Cotorro, Nadal practiced in full sun in one of the Melbourne training tracks Park, in a session that could follow a good number of fans who did not stop to encourage the Spanish. In the end, Rafa rewarded them with a few autographs. He was also visited by executives from KIA, one of the companies that sponsor him. All the team of Nadal, the physio Rafael Maymó, the press officer, Benito Pérez Barbadillo, the representative, Carlos Costa, the representative of Nike , Jordi Robert Tuts, and the father of the player, Sebastià Nadal, accompanied the winner of 17 Grand Slam who will seek the 18th against Novak Djokovic.